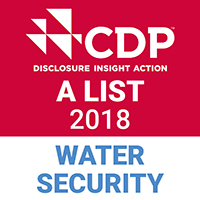 Suntory Beverage & Food Limited has been acknowledged as a CDP Water Security A List 2018 company after being highly regarded by the CDP (an international non-profit organization providing environmental information disclosure systems) due to company initiatives including activities serving to reduce water used at its plants and its Water Resource Cultivation initiatives. This designation means that Suntory Beverage & Food Limited is acknowledged as CDP Water Security A List 2018 company for three consecutive years. This result was announced during the CDP 2018 Japan Report Session held at Otemachi Financial City in Tokyo’s Chiyoda Ward on Tuesday, January 22nd. CDP is an international NPO which works to measure, disclose, manage and share important environmental information on entities such as companies and cities. Since 2003, the organization has worked on behalf of great number of institutional investors to collect and subsequently analyze information on business risks and opportunities emerging due to greenhouse gas emissions and climate change. Results are published annually. Starting in 2010, CDP began collecting and analyzing information concerning water-related risks and in 2014 the organization began carrying out investigations targeting 150 Japanese companies. Starting in 2015, the organization began conducting response evaluations. This year, investigations were conducted with the approval of 650 institutional investors from around the world managing a total of 87 trillion US dollars in assets. We see the CDP Water Security A List for 2018 as a comprehensive appraisal of our efforts based on the Suntory Group Sustainable Water Philosophy. These efforts include water cycle surveys by the Suntory Institute for Water Science, cascading (downcycling)* of water at plants to reduce amounts of water used, Natural Water Sanctuary Water Resource Cultivation based on scientific principles, and regional initiatives such as the Suntory Mizuiku-Natural Water Education Program etc. *Cascading (downcycling) is a technique that serves to categorize water used in the manufacturing process into grades or washing levels (such as water used for cooling and water used for washing). Cascading entails the stratified re-usage of water from applications requiring higher grades of water within applications requiring lower grades. Suntory Beverage & Food Limited has made a promise to society in the form of “Mizu To Ikiru”, and has developed various activities related to water over many years, such as the Suntory Mizuiku-Natural Water Education Program for the next generation, in addition to preserving and regenerating nature and reducing environmental impact. In January 2017, the Suntory Group Sustainable Water Philosophy was set forth as our basic philosophy when conducting activities related to water, and we are sharing our stance and approach towards water across the globe including at our overseas group companies. Most recently, Suntory Okudaisen Bunanomori Water Plant acquired the first “Alliance for Water Stewardship (AWS)” certification in Japan in relation to sustainable water use in the basin surrounding the plant. Also in 2018, we established 2030 Environmental Targets to contribute to the creation of a sustainable society built on preserving and regenerating nature and reducing environmental impact by way of our responsibility as a company supported by nature’s gifts. In this way, we are carrying out various activities to reduce environmental impact. We will continue sharing our group philosophies with all members of our group, which means more than 300 companies in Japan and abroad. We will also be undertaking activities that are tailored to each individual regional environment so as to contribute to the conservation of water, the most precious resource we have when it comes to our business.